5% Discount if you order online and free delivery. You can choose you own flower colour! 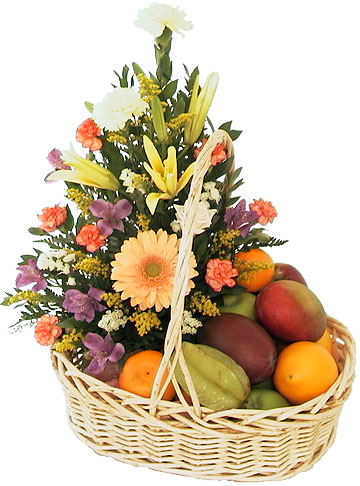 A selection of lovely fruit and wonderful fresh flowers beautifully arranged and presented in a lovely basket with decoration. A lovely selection of fresh fruit presented in a basket. Free delivery in our Essex delivery areas and 5% discount if you order online! Comes in a basket, beautifully packaged with a big bow and a message gift card. Our standard fruit basket comprising a lovely selection of fruit including apples, pears, bananas, grapes, pineapple, kiwi, plums etc. Free delivery in our Essex delivery areas and 5% discount if you order online! Comes in a basket, beautifully packaged with a big bow and a message gift card.